Size: Dia 83mm x 150mm Height. Bottom Material: Glass (Color: Clear), Sprayer Material: Brass (Color: Matt Gold), All Handmade Items. 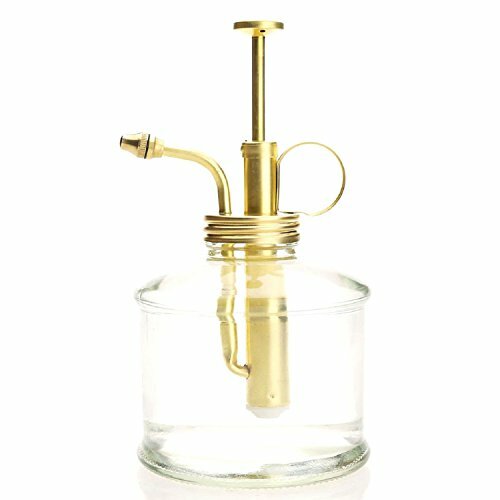 This brass mist sprayer from "Purismstyle" is the ideal tool for your indoor gardening. Frequent misting benefits orchids, ferns and many other indoor plants that thrive with humidity. The mist allows water to slowly permeate the soil and create an even watering. Simple depress the easy press plunger to deliver water to your plant arrangements. This brass sprayer produces (Anti-Rust) a fine mist that's gentle on plants, and unlike plastic sprayers, it's so pretty you won't mind leaving it out on display with various color available. Delivery by Hong Kong Post (Air parcel), Delivery lead time: About 7-10 working days. Fill-RITE Hose 20 ft. 1 in.